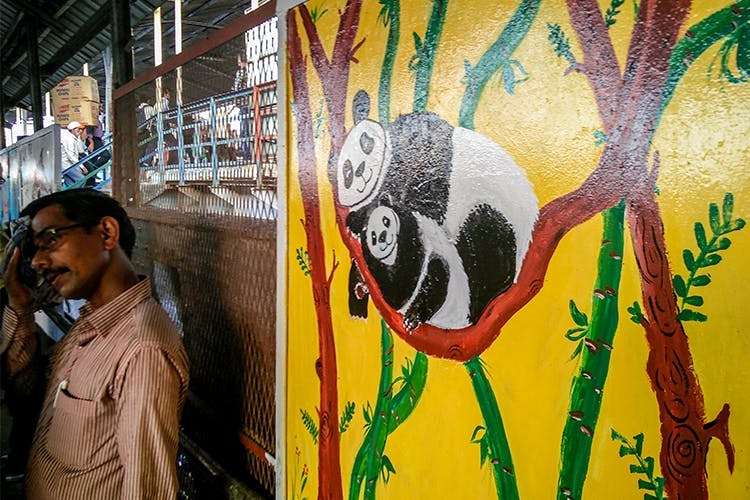 Coming and going by Bandra station has now become a colourful feat, with the walls of the station being adorned by adorable graffiti of guess what – dogs, pandas and other adorable animals. As reported by MidDay in this piece here, the lovely folks from People For Animals, Bird Helpline and the Western Railway have joined hands to fill the walls of Bandra station with graffiti of dogs, animal welfare and environmental conservation. From June 11, 2017 the overbridges at the station have started being painted with slogans, artwork and messages by a team of painters, artists, volunteers. The aim is to spread the message about animal adoption, pet care, saying ‘no’ to plastic and keeping the environment at the heart of all we do. This initiative, reminds us of the move Hamara Station, Hamari Shaan undertaken last year. We do hope that unlike that, the work here is protected and kept clean by all the commuters. Fellow weary traveller, keep a look out for art done of wagging tails and wet-nosed cuties. It will definitely lift your spirits up.